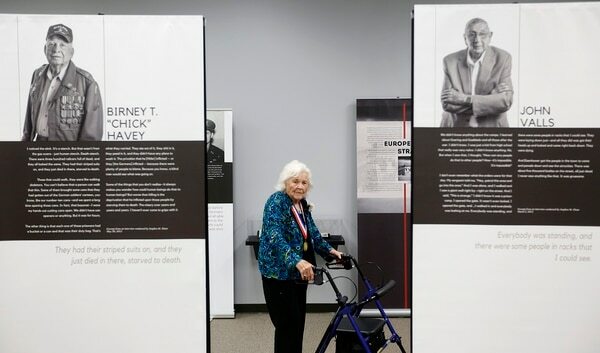 HOUSTON (AP) — Birney “Chick” Havey remembers rolling up to the Dachau concentration camp in Germany in April 1945. It was near the end of World War II, just days before Germany would surrender, and he and his Army comrades had arrived in tanks to liberate the camp’s prisoners. "They were all yelling and cheering," he said — thousands of people, joyful to see the Army arrive. "But there was an electric fence between us." The Houston Chronicle reports for nearly 75 years, Havey has lived with what he saw that day — the piles of dead bodies, the “walking skeletons” who had survived, the overwhelming smell of death and defecation, sickness and rot. It was several decades before he started to talk about what he'd seen. 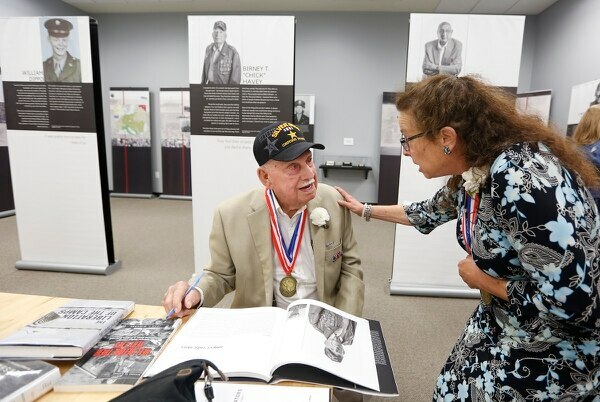 Havey, who lives in Seabrook, and 35 other Texas veterans were honored Thursday at Holocaust Museum Houston for their work rescuing prisoners from concentration camps. They or their surviving family members were given medals presented by Holocaust survivors. The ceremony coincides with a new temporary exhibit, through Oct. 28, at the museum. "The Texas Liberator: Witness to the Holocaust" features 25 Texans who were interviewed at length about what they saw when they arrived at concentration camps all over Europe. These were stories some of them had never told before — and never told again. The exhibit is part of an extensive project curated by Texas Tech University in collaboration with the Texas Holocaust and Genocide Commission, a group formed nearly a decade ago to help teach Texas students about state-sponsored mass killings. The project has identified more than 300 Texans who were soldiers in five military units that liberated more than 40 death camps, slave labor camps, sub-camps, work camps and POW camps. Many more have yet to be identified, project coordinators say. Many of the men were interviewed through the Baylor University Institute for Oral History, a project the commission funded between 2011 and 2013. From there, the commission and Texas Tech took over. The work started as an educational app, then a curriculum guide for teachers, said Aliza Wong, an assistant professor at Texas Tech who helped spearhead the project. That led to a website — TexasLiberators.org — then an interactive map system so people could find where liberators came from and the camps they liberated. And finally the museum at Texas Tech built a permanent exhibit. Wong curated the Houston exhibit and edited a hardback book, "The Texas Liberators," that features photographs of several men along with their stories. "So many of these men came home and didn't want to talk about it," Wong said. "They wanted to protect their families from this. They thought that by fighting, they had protected the next generations from atrocities like this." William Dippo, who was almost 90 when he died in 2014, went decades without telling his five children about what he'd seen at Mauthausen concentration camp in Austria, said his son, Bill Dippo. "He never wanted to talk about it." Then several years ago, "out of the blue," he asked his son in San Antonio whether the city's Jewish community center had a Holocaust memorial. It did, and Michael Dippo took his dad to see the exhibit. "He started talking, and it all started coming out. And he started crying." The elder Dippo described what he saw at Mauthausen for a Baylor interviewer in 2011. The camp "was really the walking dead," he said. "To see these human beings walking, shuffling and mumbling, and they don't know what to do and what's going on. It was terrible." He saved some pictures taken at the camp, which his children have donated to the Jewish community center in San Antonio. "If I ever mention it or even think about it, I get emotional," William Dippo said in 2011. "It's — I can't help it. Because it's there. It'll never go away." William Dippo was just 17 when he joined the Army. "He saw things that nobody should ever see, much less a 17-, 18-, 19-year old kid," Michael Dippo said. And the young men who liberated the camps had no idea what they were about to see. "We didn't understand what we were running into," said Havey, the veteran who liberated Dachau. "We had no forewarning." In fact, Havey said, when the men first saw the prisoners they didn't fully understand what was going on. "The big question was, 'What did these poor people do to get in this camp? What crime did they commit?" he said. "In retrospect, we found out — nothing." The first time Havey talked about what he'd seen was about 40 years later, at a reunion of the 42nd Infantry Division. "We all got in our hotel room," he said. "The guys in my company that were there, we kind of discussed our experience ... and that kind of loosened things up." About 100 people turned out to witness Thursday's medal ceremony — most of them liberators and their families. One by one, they came to the front of a tightly packed room, often receiving warm hugs and kind whispers from the Holocaust survivors who hung medals around their necks. Amy Ashby-Pike received a medal on behalf of her father, William Watterson Ashby Jr., who liberated the Buchenwald camp in Germany. 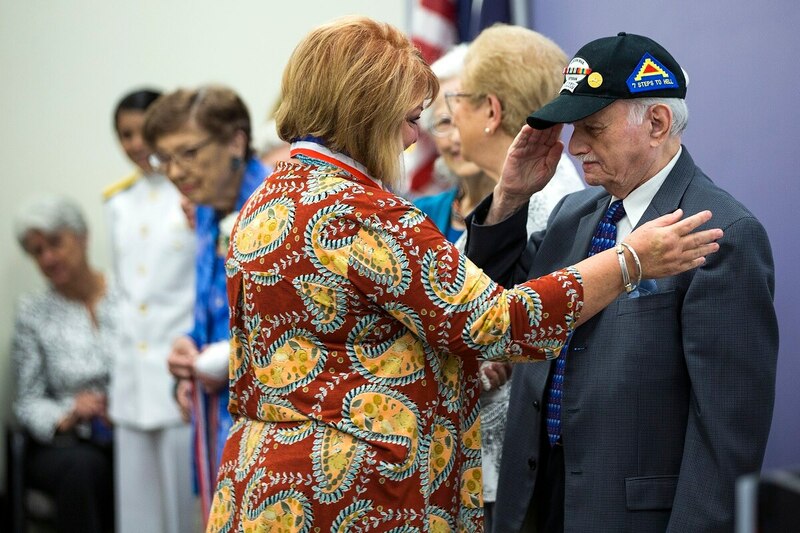 Survivor Bill Orlin — who escaped Europe during the Holocaust as a boy, then served as an American in Korea — saluted Ashby-Pike before he gave her a medal. "Thank you for your father's service," he said, calling Ashby-Pike's father a hero. "It is my honor to salute you." 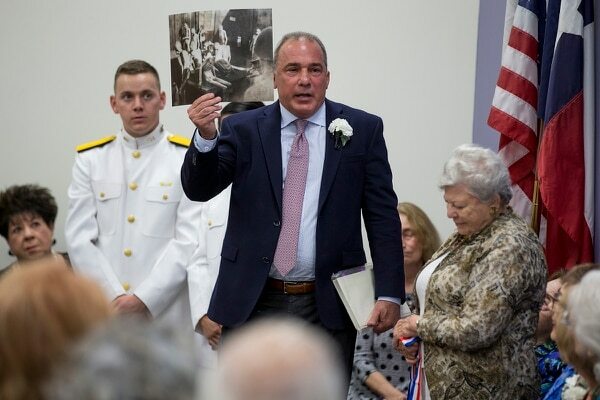 At Thursday's ceremony, Michael Cokinos showed the crowd a photo from a camp in Poland that his father, Mike Cokinos, carried with him until he died in August at 98. Eight or nine prisoners can be seen in the black-and-white shot, so emaciated their skeletons are visible. "That's my father, right there," Cokinos said, pointing to the profile of a man at the photo's edge. Mike Cokinos saw combat in the Battle of the Bulge, was awarded a Purple Heart and retired from the Army as a brigadier general. But liberating three concentration camps in Poland was one of the accomplishments he was most proud of, his son said. "It's terrible what (the Nazis) did to these people," Cokinos said. "He said there were dead bodies piled up in closets." He pointed at the photo. "These men couldn't eat," he said. "All they wanted was sun, because they hadn't seen the sun." The men who liberated the Nazi camps often didn't know what to make of what they'd witnessed, Wong said. "Many of these liberators, they were willing to talk about the war, they were willing to talk about the fighting," Wong said. "But this — they had so not expected this. And they carried it with them." When they were asked to sit for interviews about what they'd witnessed at the camps, "it really was answering a second call to duty," she said.